White gold is made up of pure gold mixed with other white metal(s). What is white gold made from? Pure gold isn’t suitable for every day jewellery as it is too soft. White gold is achieved by blending 24 carat gold (75%) and other white metals (25%), also known as alloys, like nickel, palladium or silver. These alloys makes white gold a light grey colour. Even with the added metal alloys, white gold isn’t white at all, but a light grey colour. It’s actually the rhodium plating that gives white gold its much sought-after colour. Why should I choose a white gold ring? This popular precious metal remains a classic choice for engagement and wedding rings. Appealing to modern brides and grooms who desire the weight and feel of gold with the colour and brightness of platinum. 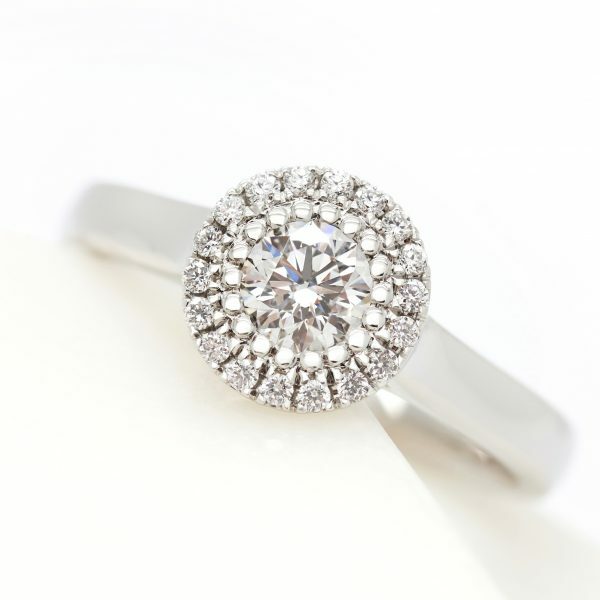 Diamonds take centre stage when set in white gold be it an ornate or simple design. White gold has the same bright, lustrous sheen as platinum, but at a slightly more affordable price. 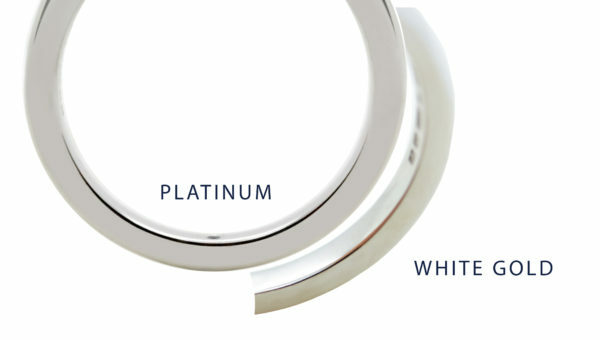 However, be aware that white gold requires a level of maintenance that platinum does not. What kind of maintenance is required for white gold? To retain its bright sheen, white gold is plated with rhodium. With time, rhodium plating will wear away, revealing a yellow-ish tinge. Rhodium plating needs replating every 12-18 months to maintain its lustre and radiance. So while white gold is initially more affordable, there is a maintenance cost involved every 18 months or so. It’s for this reason that one of the most frequent questions we hear is ‘should I choose platinum or white gold?’ Read the pros and cons of platinum vs white gold below.